Don't look for anything very fancy here, these are just cases and their purpose is to store things. 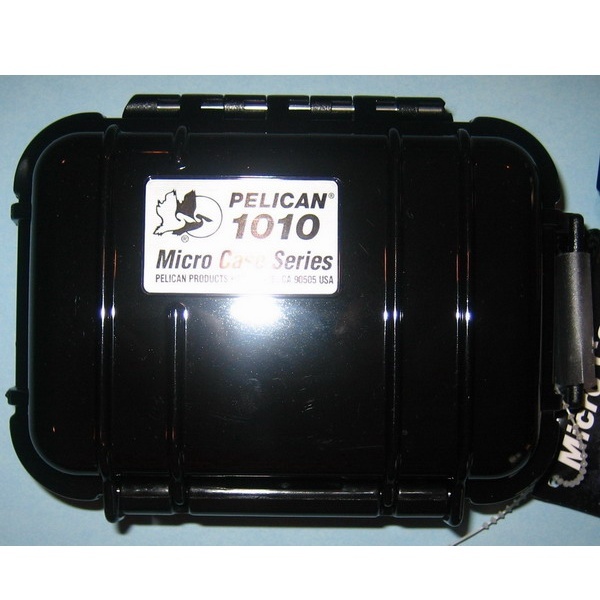 So what better for valuable gadgets than very special cases like the ones from Pelican? These cases are shockproof, waterproof, and dustproof. They even come with a pressure valve to release pressure from the inside in case of need. You can get them in many different colors and sizes, the 1010 in the picture is the smallest one, there is a i1010 version for Ipods with an outlet for earplugs. You can also get foam inserts for the case that can be shaped to accept different items, for example batteries. The cases are produced in different colors: black, yellow and clear. They are great to carry gadgets around without worries about bumps, falls or humidity. Price starts at about $10 and up for the bigger ones. (i1010 for Ipds $35). You can get more information at Pelican website. Spyderco Knives are among the favourite utility knives for EDC, the Delica is a classic model that has been used a lot as a general purpose knive, sturdy to resist normal and not so normal use without costing a lot of money. The Wave is a new version of the Delica designed to be used clipped to a pants pocket. When you pull the knife out the "Wave" in the delica clips to the pocket opening the knife in the same single motion you use to pull it. This is on one side cool and on the other side may be useful in an emergency situation. The Blade is VG-10 steel and the lock is a front lock. 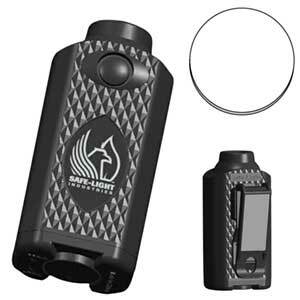 It comes with a pocket clip and you can get it for about $50. 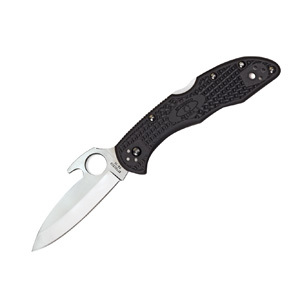 Check Spyderco's website for more information. 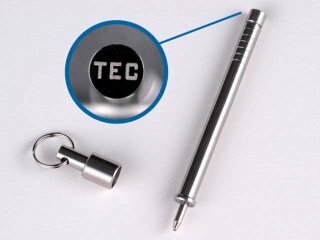 The PicoPen is a really small keychain pen. The cap with the small split ring is magnetic and that is what holds the pen inside the cap, no pressure or threading. The pen comes in a very nice mettalic box with a nice set of accesories: a claw clip and a twisty keyring. The pen writes well and the small size and design is great for a keychain. The magnetic cap is not a problem for credit cards or thumbdrives because the magnet is not very strong but can be used to attach the pen to some mettalic surfaces if you want. You can get it for $20 from TEC website. The Safe-light uses a 9 volt battery to power a 5mm led. This light is intended as an emergency light but can be used as a regular flashlight if needed. By default the light will be in "locator" mode a very dim always on mode that can be used to find the light in the dark, the light can run for about a year(!) in this mode that can be deactivated pressing the button for 2 secs and reactivated in the same way. From the always-on mode you can activate the low-beam flashlight then high-beam and then the emergency strobe before returning to the always-on mode. You cycle through modes just pressing the button. The light is water resistant and comes with a belt clip that is also magnetic. It is a very good product to keep in different places in the always-on mode so you can use it if you are in need, one at home, one in the car, etc. You can get it for $14 at Lighthound. And you can learn more in the official website. 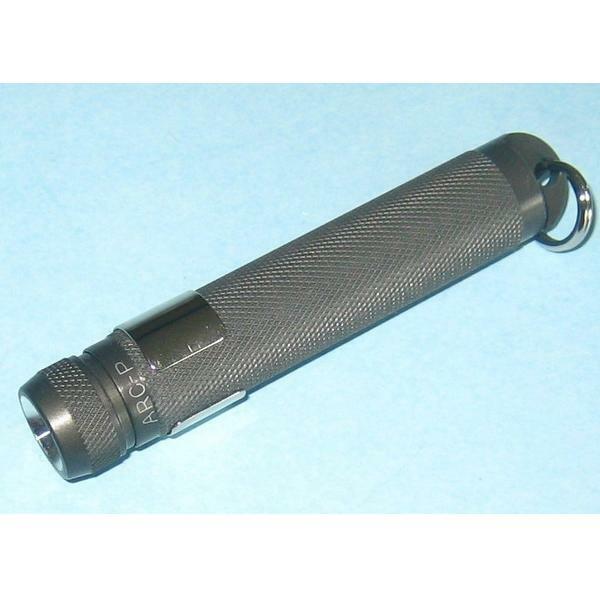 The Arc AAA was for a long time one of the best keychain flashlights available in the market. The company had trouble and folded but re-emerged to the market for a new version of their most popular light. The Arc AAA-p is a brighter version of the flashlight. The Arc is powered by a AAA battery (lithiums and NiMh are fine) driving a Nichia 5mm led. The good things about the arc are its toughness and runtime, built in a very strong HA-3 finish this flashlight can resist all kinds of use and abuse. It is a very good companion for a keychain or neck carry because of its small size. It retails at $40, expensive for a 5mm led light but explainable for a light built in the best way using the best materials. You can find more info about this flashlight in the Arc website.